Thank you for all your support for 2016. This is my final pick for 2016 before moving on to year 2017. I believe 2016 has been a hard year for many and let's see if this final pick can help end the year with a bang. YeeLee released their recent QR and the share price barely moved despite an improvement of 28% YoY and 7% QoQ. While the revenue growth QoQ was marginal, YoY it recorded a strong showing growing from RM 197 Million to RM 247 Million. For the immediate preceding quarter, the profit grew from 5.45 EPS to 5.85 EPS. NTA increased to RM 2.97. If you look at the revenue growth for the past 4 quarters, you can see the significant increase and most importantly, it has reached a new level from the earlier year. Currently, each quarter, YeeLee is delivering at least RM 200+ Million per quarter compared to 1 year ago in the RM 150+ Million per quarter level. On top of that, the profit margin has improved from 4% to 4.3%. This is amazing considering that a year of improvement has such significant change yet when you look at the share price movement in the past 52 weeks, you will notice the share price barely reflect the improvement. Last year it was trading around RM 2, it went to a high of RM 2.45 before retracing. Currently, it is trading at only RM 2.30. This indicates how undervalue YeeLee is. Additionally, for 3 Quarter of 2016, the total revenue of Yee Lee is around RM 765 Million compare to 2015 full year 4 quarters at RM 799 Million. 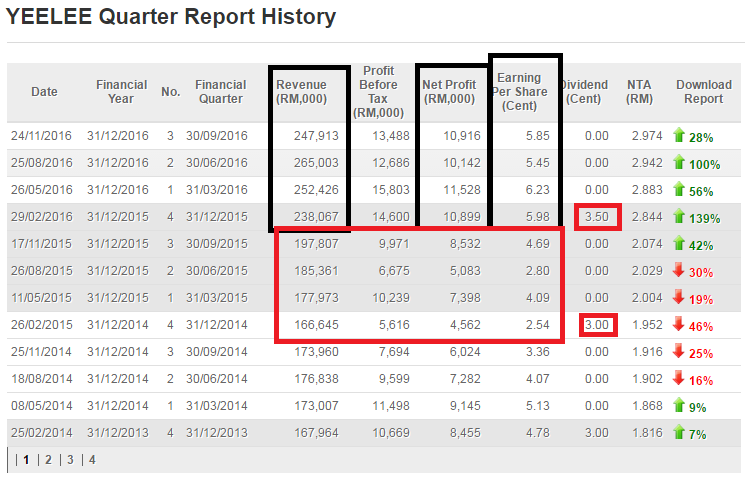 Net profit for 3 quarters also surpassed the full 4 quarters of 2015 at RM 32.5 million vs RM 31.9 million. It is very obvious that YeeLee will bring the company's revenue and profit to a record high for 2016. 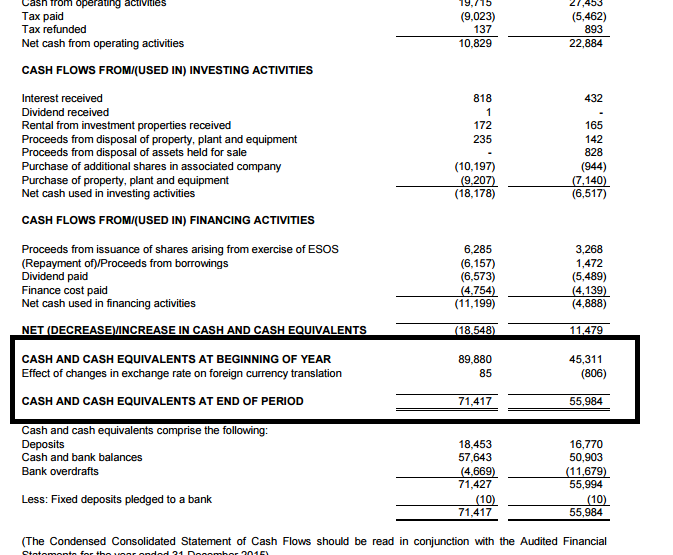 In the past, YeeLee declares minimal dividend as most funds are use to expand the business which is good. However, when the company's performance improves, the dividend increases. Case in point, YeeLee increased the dividend from 3 sens in FY 2014 to 3.5 sens FY 2015. I believe, it is likely for FY 2016 that dividend will increase again. In short, this is a record year for YeeLee. When we read into details of YeeLee, it is obvious that the distributorship of RedBull, Ribena, Lucozade and also the impending plantation business turnaround is what brought Yee Lee profitability to a next level. Manufacturing still takes the leading position in terms of contribution which is in line with the increase in CPO price but the trading business is catching up with strong increase in volume. Plantation narrowed the losses via the selling of timber, palm oil is still loss making due to replanting exercise and tea plantation is still on track for improvement. Considering the tough market, it is very comforting to see the management confident with the future prospect. Strong management in difficult business times is another plus point. The increasing net cash position of Yee Lee and its NTA is clearly a sign of stability in uncertain times. However, I would appreciate if YeeLee management may consider rewarding long term shareholders. 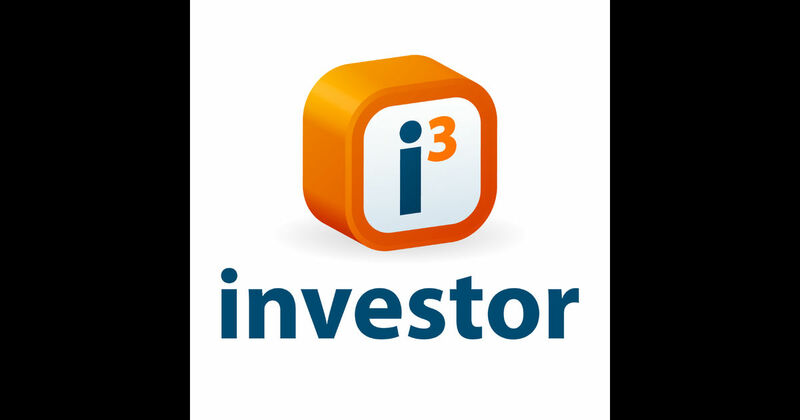 I believe YeeLee is currently undervalued at 10x trailing PE for a solid consumer stock. 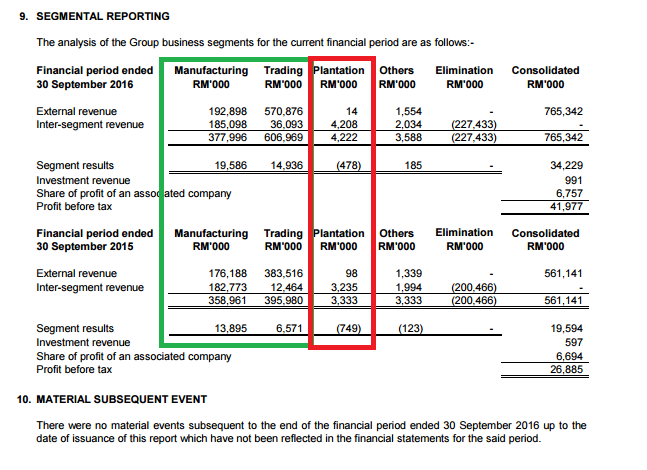 Forward looking, assuming the management is able to maintain their profit margin and revenue whilst improving their plantation business, the company should be able to deliver a full year estimated EPS of RM2.40. I am not looking for further growth but maintain last quarter performance of 2015 suffice. Applying a multiple of 12x, the fair value would be RM 2.88. This is excluding their potential future growth and dividend growth. Other consumer peers like Cocoaland and, Apollo are all trading at multiples of 12x and 19x respectively. 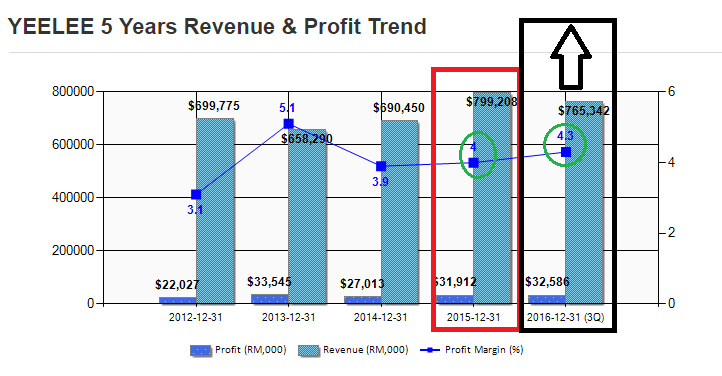 These companies' revenue and profit trend are also decreasing as compared to YeeLee. I am confident YeeLee can maintain its growth trajectory as per the past years. At time of writing, the share price is trading at RM2.32, it is my take to collect YeeLee and hold until the market realises it true value. As the market is lethargic, I will be conservative to apply a multiple of 11x and arrive at an initial TP of RM2.68.